KTSA reports that on Thursday, six members of the San Antonio City Council voted to drop Chick-fil-A from the new Food, Beverage and Retail Prime Concession Agreement for the airport. The seven-year contract for concession management at the terminal is guaranteed to generate $2.1 million in revenue for the Texas city. Food shops that passed with the motion included Smoke Shack and Local Coffee. City Councilman Robert Trevino was one of the council members who voted to strike Chick-Fil-A from the motion. Trevino also suggested during the city council meeting that San Antonio’s Office of Equity be involved in all future business decisions being considered by the city. “This is a very exciting project because it will refresh the airport’s footprint, addresses traveler’s requests to have local and healthy options and will even allow travelers an avenue to order food from a mobile kiosk and avoid standing in a line,” said Russ Handy, who serves as Aviation Director for the City of San Antonio. 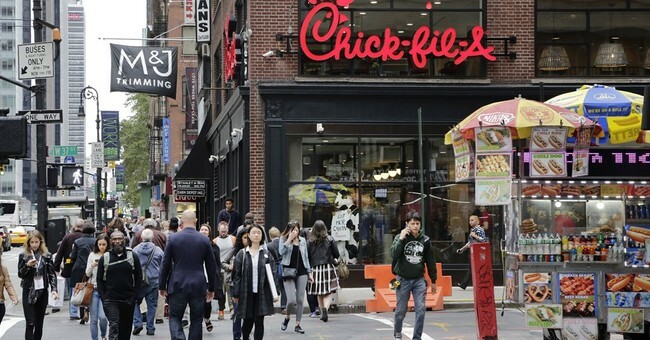 When asked by Fox News for comment, a rep for Chick-Fil-A clarified the restaurant chain’s code of conduct.